January 1, 2001 at 0100 a.m. I can count the times that it snowed here. by a Justice of the Peace. as it will happen only once in our lifetime. and I wore a garter and carried my bouquet that I made. I decorated our house, and hung out our wedding flag. Our anniversary is rapidly approaching!!!! for one of our anniversaries with all the trimmings!!! just "chill" and get married anyway!!! Later, we had a week in Seattle, Port Angeles, and Victoria, B.C. and we became good friends. Yet, we still remain...So, that must make us a really good team! british comedies, mushrooms, and all things Sci-fi. Come join us here in this New Millennium. 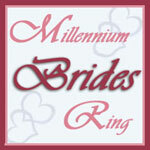 Click here to Join The Millennium Brides NetRing. 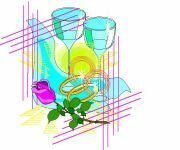 ©1996-2005~~Shari's World Web Design ~~All rights reserved.